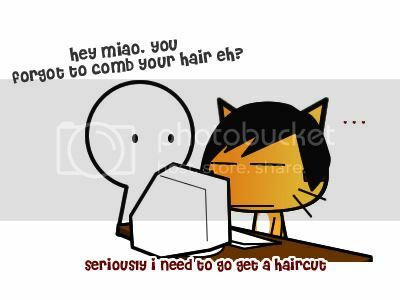 Miao & WafuPafu Comic Blog » Changing my Hairstyle. « Buddha has Anger, so do Miao. Posted on May 31, 2009 by Jian Akiraceo. This entry was posted in Ofix and tagged change hair syle, comb the other side, different look, messy hair. Bookmark the permalink. Haha,I tried doing the same thing when I was a child..lol…cos I hate cutting my hair. Miao should trim his mustache instead..hehe.. Thought of having them but before I succeed, I quit in the middle of the way. i love going to hair salon. b4 going i have lotsa idea in my head, this and that, but sampai salon, i bcome blank and end up with the same hairstyle…adoi.. HAPPY GAWAIIII!!! 3 days or 4 days of holiday ar? I can’t remember..
why not getting your whisker longer and your fur gempak! everyone and the WHOLE WORLD will noticed that! then people will starting to ask u whats serious thing happended to you…. like you break with your GF or something like that…. cos i tried that b4! lol keep it longer den can become rock star! perhaps you can stand out in the upcoming stand out event! lol! 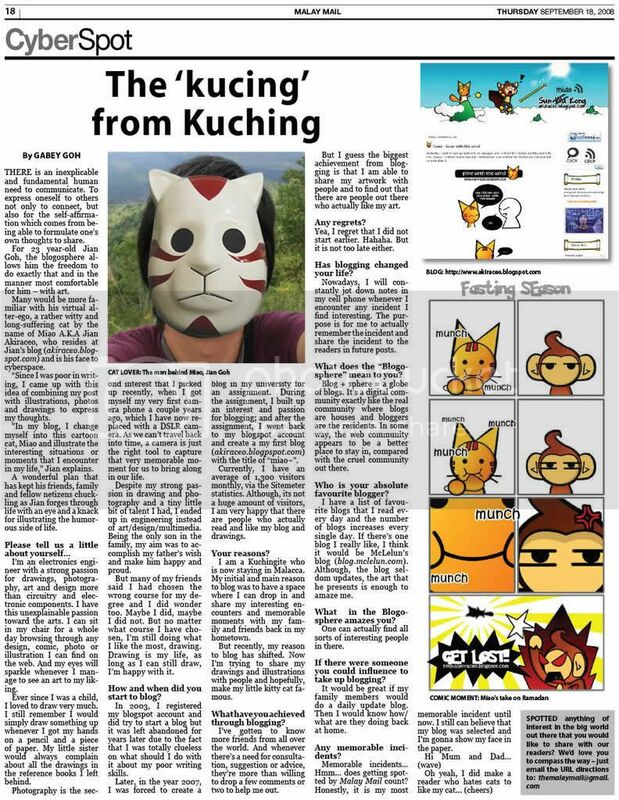 haha…so many ppl ask u to cut botak…then a furry cat became a ‘fur-less’ cat…HAHA!! I will be a botak cat LOL… don’t want. Me wan a haircut too! >.< My fringe is annoyingly covered my sight. But I’m so scared to have a haircut because I don’t trust the barbers!! Sometime they make me “surprises” that I don’t want =( Plus,KL haircut price is so expensive compare to my hometown eh. Hahaha then you can try ask them to stick with the hairstyle and remove all the fringes only. Just scroll up and read the comments. Haha, cut botak and sell it for fashion designer just like the 101 doggie thingy bla bla eh? haha..then there will be miao fur and save lotsa near to extinct animals. Long hair guy quite cute if you know to style it! Anyway think throughly what style you want ar.. Later cut dy don’t regret wo!! erm, mayb u can try getting some botak yet not too botak hair like Justin Timberlake. An Indian guy with thick-misai walks towards a chair,pull out an electric hair clipper. Result:Sideburn-less with spider pattern on top. adui~ i really feel “cold” at the last dialog lol!! i m sure u feel the same rite?? hehhee.. Cold? Hmm no lor.. I understands why she said that as my hair was covering partial of my face.